I want to apologize that you are receiving your newsletter a day late. I had to make an unexpected trip to take care of my Grandfather. Thanks for your understanding! 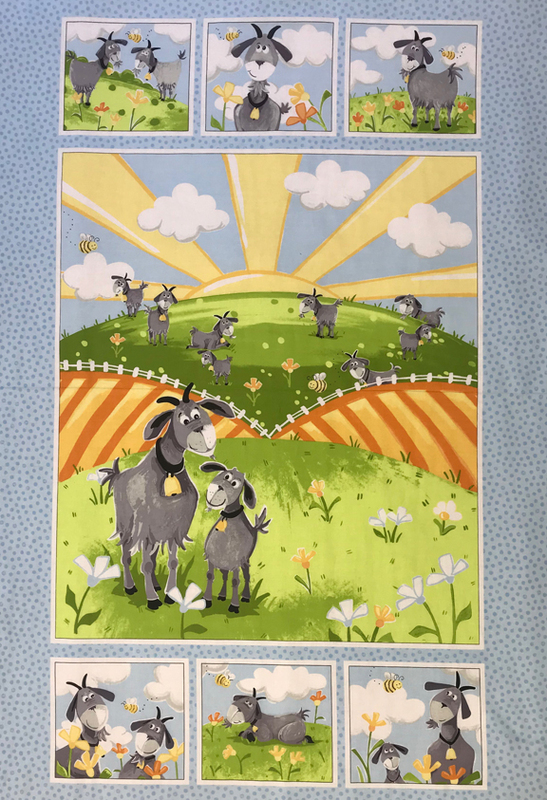 Susy Bleasby began painting large murals on the walls of pediatric wards, and realized how people were cheered up by her designs. 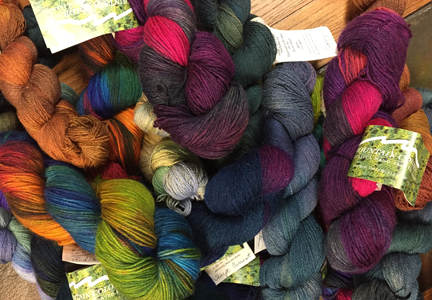 This led her to take her characters to the world of textiles. Hildy the Goat is her most recent creation. We just received this fun panel. 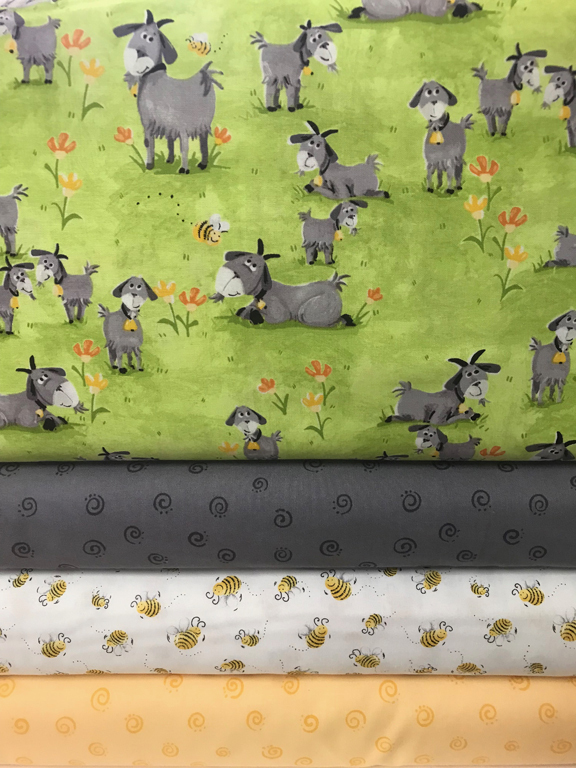 Here are the coordinating fabrics. Hildy is a delightful character, and will definitely brighten up your baby and youth projects. Goat lovers will also enjoy this collection. Enjoy an evening out! This class is created for those of you who work during the day, have young ones at home, or are a night owl. 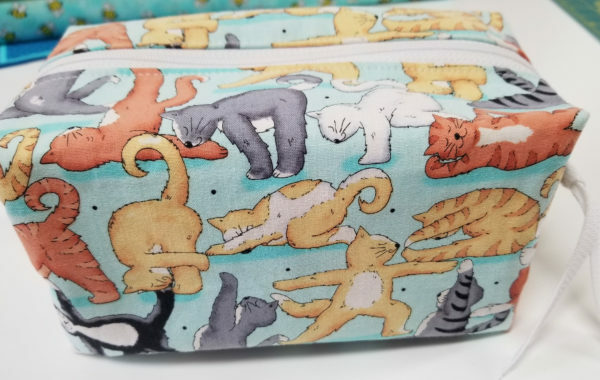 A shop favorite, these cute little zippered pouches look like mini duffle bags. 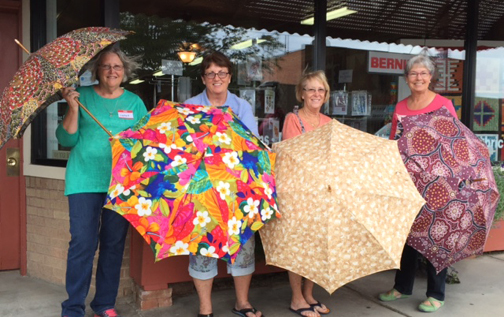 The pattern comes with instructions for four different sizes – all your needs are covered. Tricia will be your instructor. This quilt is an all time favorite. 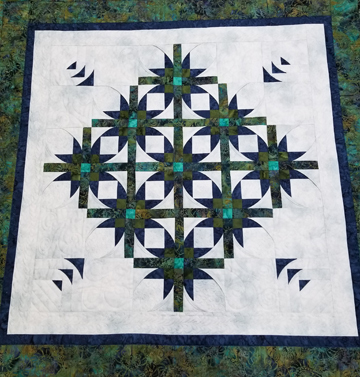 Participants in this class will learn that piecing a curved quilt is almost as easy as sewing a straight line. You won’t want to miss this class! Judy Bryan will be your teacher. Break out your vinyl mesh! 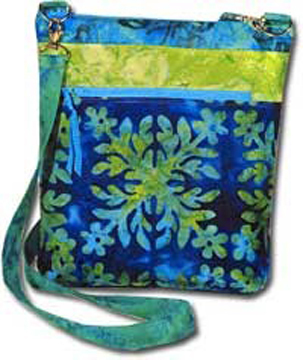 We have found a new pattern for a tote, this time with a drawstring closure. Pair it up with a fun fabric, and you are ready to head out for day of shopping, or a day relaxing by the pool – just add your own goodies. Sue Maxwell will be instructing this class. We are very excited to announce this will be the first meeting of the CQC Software Club! This Club will be meeting the 1st and 3rd Tuesdays of the month, at 5:30. We will provide snacks, as several customers are coming straight from work. Please call us for more info, and to RSVP. 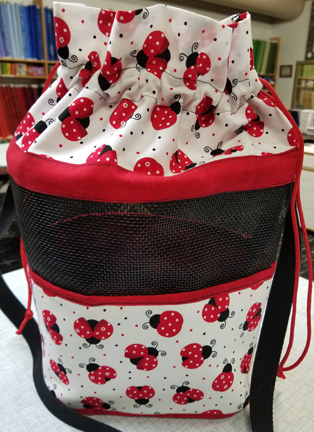 Sarah will demonstrate how to use the binding tool – she has mastered a lot of tricks to make this attachment easier to use. 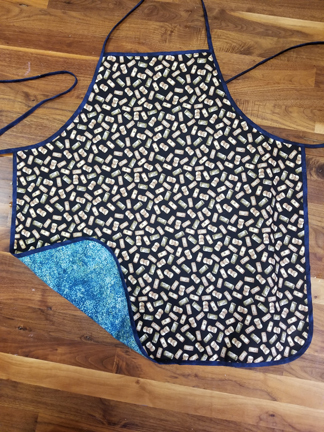 After the demo, we encourage everyone to stay to make a reversible apron that is finished with bias binding, and have a chance to use the binding tool themselves. 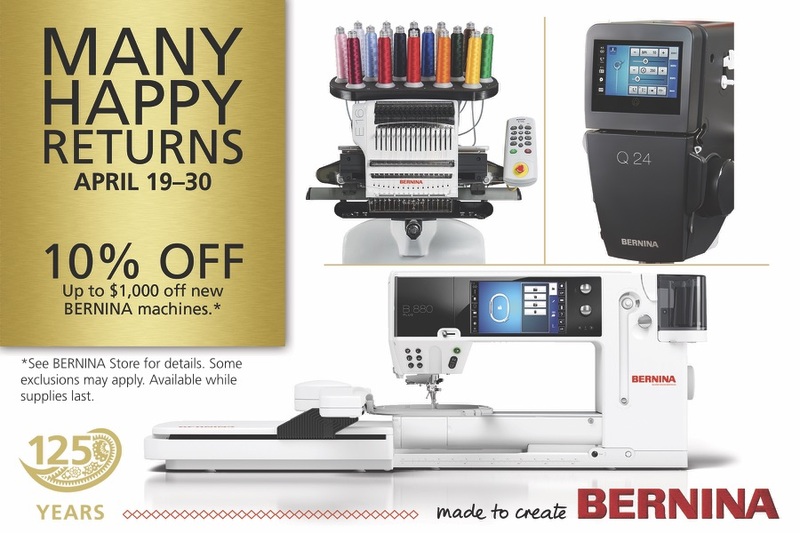 Here is a great opportunity to save money on a new BERNINA. Put your tax return to good use and enjoy 10% off up to $1000.00! With BERNINA, you can achieve a true 1/4" seam with feet that are perfectly designed for perfect accuracy. 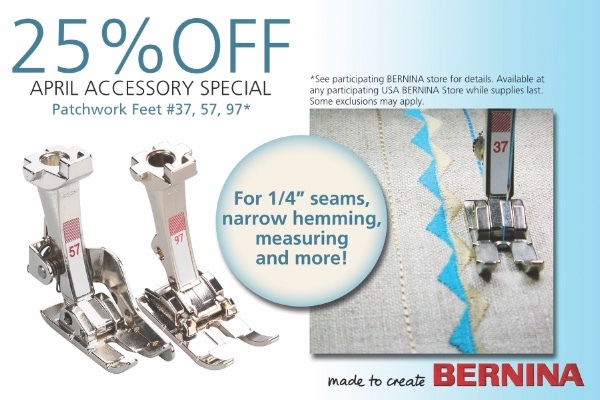 In April, enjoy 25% off of BERNINA Patchwork Feet. Choose from Patchwork Foot #37, Patchwork #57 with the guide, or special Patchwork #97, which is made for 9mm capable machines. This offer is for all the brands that we offer: Mettler, Aurifil, Gutermann, and Isacord. Now is the time to stock up! Offer expires on Saturday, April 14th at 6 p.m. You can not use this discount on Isacord along with the Buy 4, Receive the 5th Free. 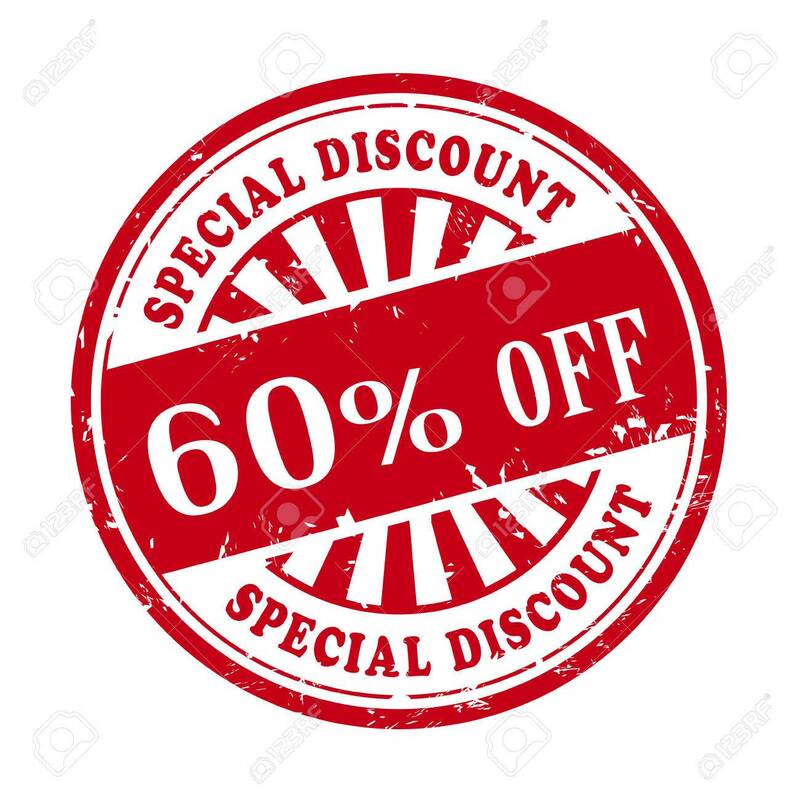 You must mention that you saw this offer in the Quiltzette to receive the discount.